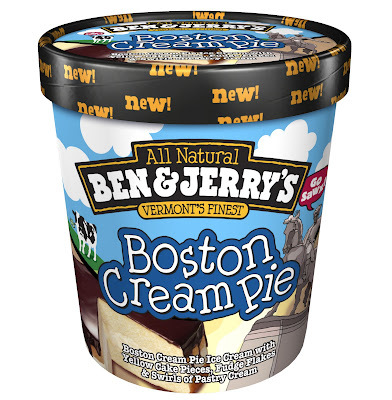 "She said I think I'll go to Boston..."
In honor of the original Boston Cream Pie, created in 1855 at the former Parker House Hotel in Boston, Ben & Jerry’s announces its newest creation to Bostonians and pie lovers nationwide. To mark its arrival, Ben & Jerry’s will be offering free scoops of the new Boston Cream Pie flavor at its Boston Scoop Shop locations on Patriots’ Day, April 19th to celebrate the iconic Massachusetts state holiday. Stop by 174 Newbury Street, 800 Boylston Street (Prudential Center) or 20 Park Plaza for a complimentary scoop from 10:00 am – 12:00 pm while supplies last. 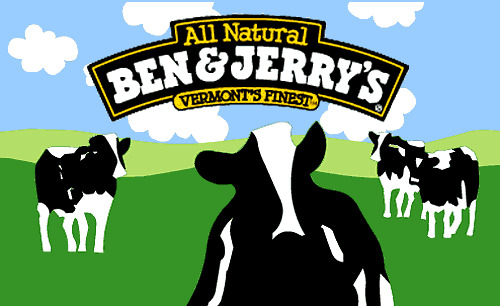 “We decided to turn the official dessert of The Commonwealth into our newest flavor,” said Ben & Jerry’s Director of Marketing, Dave Stever. “We think it’s worthy of the city and hope that people kick off their Patriots’ Day celebration with a free scoop on April 19th,” Stever added. To celebrate this promotion, Financefoodie.com has teamed up with Ben and Jerry's to give away coupons for a free Ben and Jerry pint to 10 lucky readers!! To win, be one of the first 10 commenter to tell me: "What is your favorite Ben and Jerry's ice cream flavor?" *don't forget to leave an email address so I can contact you if you are one of the top 10! Boston Cream Pie will be available in Scoop Shops nationwide starting in early May for a limited time. The flavor is available now in pints on grocery store shelves across the nation. For more information on Ben & Jerry’s or to find your local Scoop Shop, visit www.benjerry.com. My favorite Ben and Jerry's ice cream flavor is Chunky Monkey :) *Thanks* for the giveaway! Chubby Hubby all the way! test - this does not count! My favorite flavor is Cake Batter! My favorite is a discontinued flavor- Cool Britannia. I miss it so much! I like triple carmel chunk! My favorite is Coffee Heath Bar Crunch. Hooray for Ben and Jerry's. Thanks. Chocolate Macadamia is my favorite Ben and Jerry's flavor! I love Ben and Jerry's ice cream - my favorite flavor is Cherry Garcia. Love their coffee heath bar crunch! Thanks for the great giveaway! my favorite is butter pecan! My favorite flavor is "Coffee Heath Bar Crunch". Ben & Jerry's is magnificant - I thought I liked Butter Pecan before I tasted theirs. Gee, come to find out, I'd never really TASTED Butter Pecan before! YUM! I like the Black Raspberry lowfat yogurt. I love the Banana Split flavor. I grew up in Ecuador and I love bananas! i am a huge fan of dave matthews band magic brownie! Honestly, I have never tried Ben & Jerry's icecream. I love ben&jerrys,cheesecake brownie is awesome! I like Magic Brownies from Ben and Jerry's. Mine is chocolate chip cookie dough!!!!!!!! Chubby Hubby... hands down, no question... i mean chocolate-peanut butter filled pretzels... yes please! I love their chocolate macadamia. It is soo good. Chubby Hubby is my favorite flavor. My favorite flavor is Cherry Garcia - an oldie but goodie. I love B&J. Makes VT a much more appealing state! "Mission to Marzipan" should be a continued flavor, it's my fav! Also I really enjoy following your blog! Definitely gives me a heads up on where the best eats are in Boston. Will continue to tune in! Cherry Garcia will always be my #1. Gonna have to go with Chubby Hubby.